Both monsters must be Special Summoned under your opponent's control. 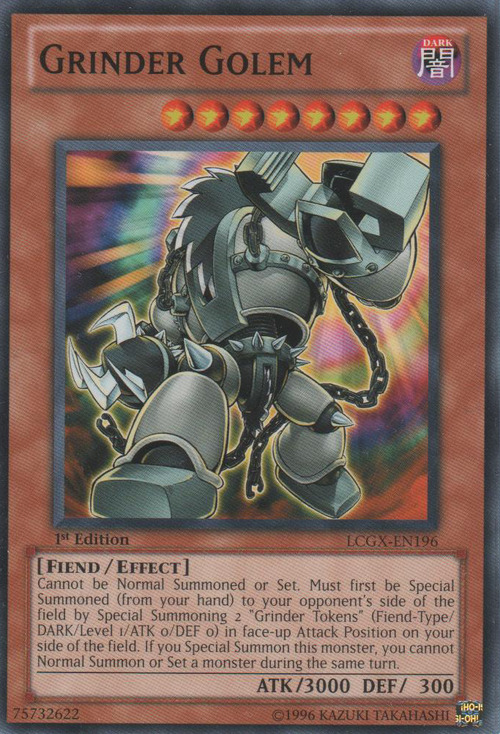 Both require 2 monsters to be Summoned, but this card requires Tributes while Grinder Golem provides 2 monsters for the player who Summoned it. After the Special Summon, neither monster allows Normal Summoning or Setting another monster during the same turn. Both monsters also have 3000 ATK. Both monsters are Golems, as their names say. Yet also both monsters don't have a typical fiend-like physical appearance; Lava-Golem looks more like a Pyro-Type and Grinder Golem looks Machine-Type like. You cannot Special Summon "Grinder Golem" if you do not have 2 open Monster Zone Spaces for the "Grinder Tokens". If your opponent negates the Special Summon of "Grinder Golem", the "Grinder Tokens" remain on your side of the field and you cannot Normal Summon or Set that turn. If you Special Summon "Grinder Golem" while "King Tiger Wanghu" is face-up on the field, its effect activates to destroy the "Grinder Tokens" after "Grinder Golem" is Special Summoned. Giant Trap Hole:" You cannot activate "Giant Trap Hole" when "Grinder Golem" is Special Summoned. Queen of Thorns:" If you Special Summon "Grinder Golem", you only pay 1000 Life Points, because the "Grinder Tokens" are not Special Summoned from your hand.